Have you been planning to buy a laptop that comes with the latest features and engineering? Well, you can end your search and rest your faith by purchasing the Dell Inspiron 5567 Laptop. This laptop has been designed keeping in mind the latest features so that you can enhance your work and upgrade your skills. Have you been planning to buy a laptop that comes with the latest features and engineering? Well, you can end your search and rest your faith by purchasing the Dell Inspiron 5567 Laptop. This laptop has been designed keeping in mind the latest features so that you can enhance your work and upgrade your skills. It comes with features that function with high speed and without losing its essence even if you use it continuously. It lives up to its name and does not wear out with time. The functions enable the laptop to perform smoothly and with excellent control. It also comes in a sleek design, which increases its credentials and enhances its functionalities. The classic gray color adds to its elegance and makes it attractive. It also comes with a powerful battery, which is a must-have and of great importance when you buy a laptop. Dell Inspiron 5567 Laptop is built with Intel Core i7 7th Gen processor. This processor comes with benefits that improve the working of the laptop and makes it more efficient. It comes with a high speed, which lets you complete your work faster and save time. This processor is the latest in its line and features all the new features, which aim at satisfying your requirements. This laptop comes with 8GB Ram and 1TB 5400rpm Serial ATA hard drive. So you can store movies, videos, files and so on without worrying about space. You can also add external hard drive if in case you run out of the provided space. This laptop is built with Windows 10 which comes with new features. It enhances the performance of your laptop. It also comes with upgraded security features, which helps in keeping your laptop safe from malicious sources. The security updates in Windows 10 are stronger than its previous versions. There is also maximum clarity in the graphics which makes browsing the web, or even working on the laptop a delightful experience. It aids in smooth functioning combined with the latest processor and the inbuilt features of the laptop. You can play advanced games and run apps without any technical glitch as it ensures seamless flow of connectivity and efficiency. It connects easily to Wi-Fi and is easy to operate. The functions are detailed and extremely user friendly. 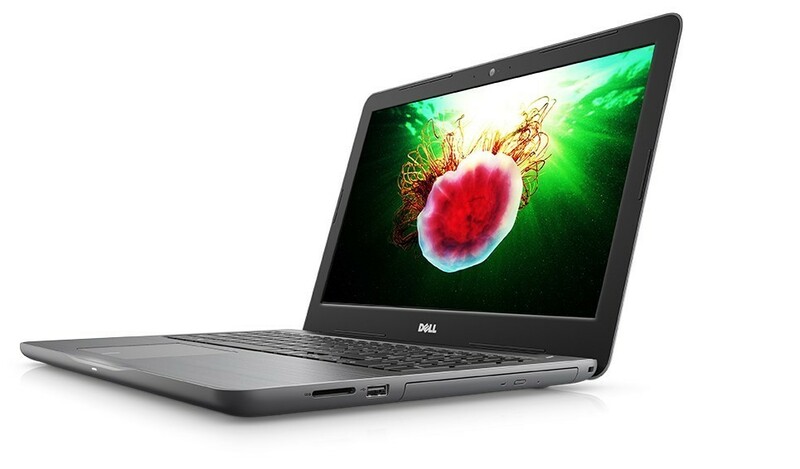 Dell Inspiron 5567 Laptops have been designed to sustain extreme temperatures. So whether you keep it in a locker room or inside a locked car, it will not damage the functioning of the laptop. It can survive harsh short-term heat conditions that last up to 65-degree Celsius or 149 degrees F. It also does not lose it flexibility and yet at the same time does not lose grasp even if you open and close the lid 20,000 times. It does not become loose and remains tight even after continuous use. With regular and continuous use the keys on a laptop become susceptible to damage by either becoming slow or not working at all. You do not have to worry about these limitations when you use Dell Inspiron 5567 Laptops. The keys on the keyboard are tested umpteen times to deliver you a product that will not stop functioning even after repeated use. The commonly used keys and touchpad buttons are tested and retested over and over to ensure durability. It also ensures proper functioning of the multimedia buttons, so much, so that it can survive up to 40,000 pushes.